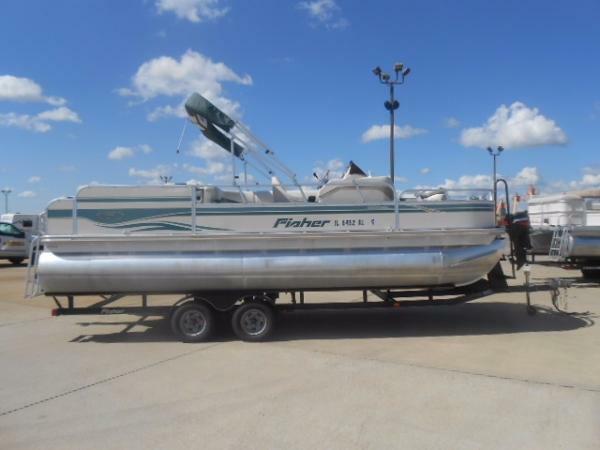 1997 Fisher Freedom 240 The Fisher Freedom 240 has all the luxurious comforts expected from a Fisher pontoon, plus it's also a very functional family fishing boat. Fishable features include an aerated livewell, four fishing chairs with composite frames, plenty of fishable deck space, and loads of tackle storage. The Freedom 240 sports 26-inch diameter pontoons for enhanced stability and better overall performance. 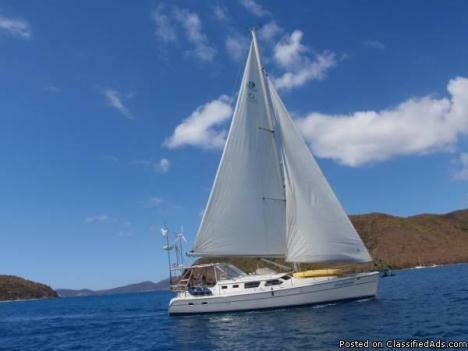 The 240 also has an all-aluminum transom, a fiberglass reinforced synthetic deck, through-bolted floor construction, and a scratch-preventing twin rub rail system. 2005 Fisher Freedom 220 DLX The outboard-powered Freedom 220 DLX is a luxurious family pontoon boat full of family-friendly conveniences like rear-entry gate with boarding ladder, padded aft sundecks with pop-up changing rooms, CD stereo systems, removable tables, and plush L-shaped entertainment areas fore and aft. A 10? 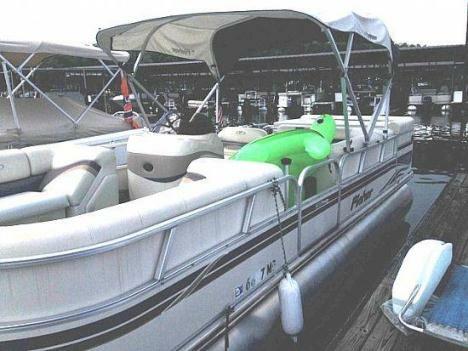 color matched Bimini top offers protection from the sun while oversized 26" multi-chambered pontoon tubes ride high and provide added safety and ride stability. The 220 DLX features a pressure treated thru-bolted deck with a limited lifetime warranty as standard equipment. PERMADECK® all-aluminum flooring is optional. 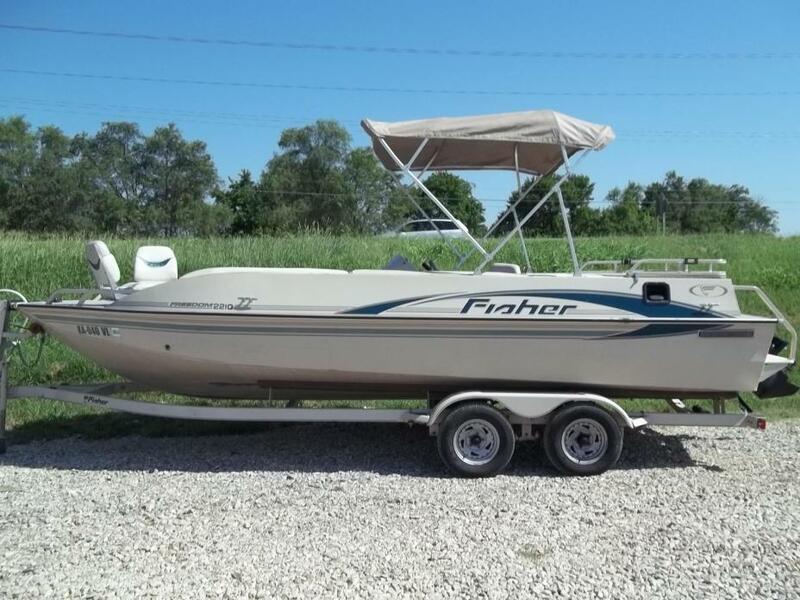 2006 Fisher Freedom 220 DLX FISH The Fisher Freedom 220 DLX Fish provides big-time fishing on a slightly smaller scale. Anglers rave about the wide-open fishing layout and features like the composite frame fishing chairs with pinchless hinges, aerated livewell and rod box. It's also prewired for a trolling motor. Of course, the Fisher Freedom 220 DLX Fish isn't just about fishing. For those who just want to have fun, there are exquisite details and deluxe features everywhere. Sun deck, large changing room, entertainment area, CD stereo with two speakers, 36-quart cooler - it's all here. Answer the call for fishing and fun in a Freedom 220 DLX Fish. 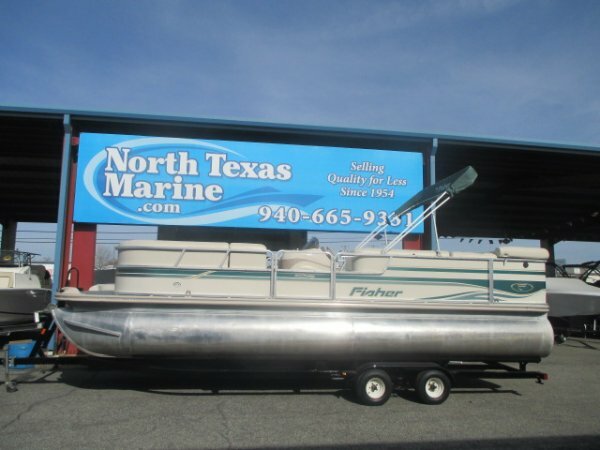 2001 Fisher Boats 2210 Freedom, 2001 Fisher 2210 Freedom deck boat equipped with Mercruiser 4.3L 190 hp inboard/outboard motor. 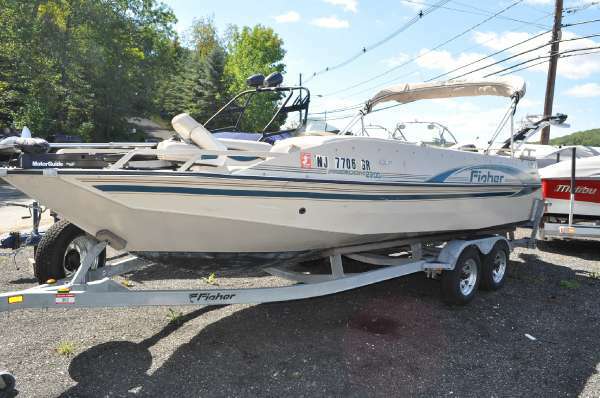 Boat includes bimini top, strap cover, rear ladder, livewell, radio, 4 speakers and single axle trailer with brakes. Please call before coming to view as our inventory changes location frequently. 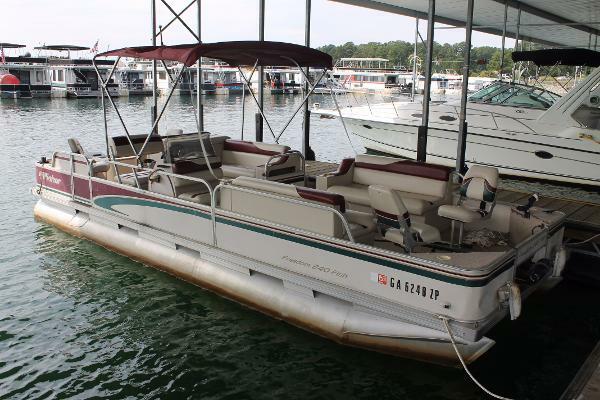 Please contact boat owner Timothy at 678-482-9603. 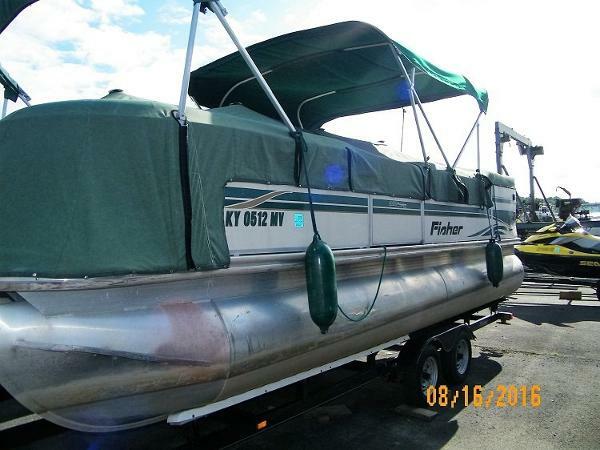 Great 24 ft Pontoon boat, seats 12, Has aluminum deck under carpet No Mildew smells Low hrs , fish finder,Stereo Cd player, new battery, motor winterized yearly, all accs. included, ropes, anchors, jackets. Front seats have been newly recovered. Weather stains on top of front seats, back sundeck has tear on seam of leather. those are the only issues with boat. 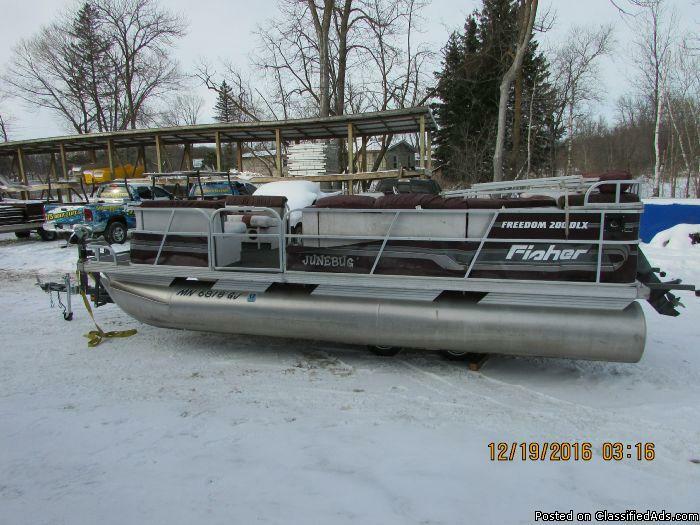 WWW.RECREATIONALSALVAGE.COM Stock #6680 1993 Fisher Freedom 200DLX 20’ Up for auction is a 1993 Fisher Freedom 200DLX 20’ with a 40hp Force 2 stroke motor. This motor was submerged. We drained and dried it. The motor starts and runs good. The lower unit is lake stained. The prop is bent and chipped. This unit comes to us due to being rolled over on the lift. On the bow the floor is broke on the casting deck and the carpet is ripped. The port side tin is popped out and dented. Going onto the port side the tin is dented in the bow and missing from the door. From the door to the stern the tin is popped out from the frame and dented. Moving on to the stern the tin looks to be in good shape except for some scratches and fading. Going on to the starboard the tin is dented in the stern and the door is missing. Going on to the inside all the seats are water logged and the back cushion covers are very loose and sagging. The vinyl on all the seats is stained and starting to crack. The carpet is worn. The back sun deck stern side storage lid is broke off. There is a porta potty located in the stern. The windshield is missing from the council. There is a cover for this unit but all the poles are missing. There is a dent on the starboard side toon. The port side toon appears to be in good shape. Good luck biding! 2003 Fisher Freedom 240 DLX Fish The Fisher Freedom 240 DLX Fish has all the luxurious comforts expected from a Fisher pontoon, plus it's also a very functional family fishing boat. Fishable features include an aerated livewell, four fishing chairs with composite frames, plenty of fishable deck space, and loads of tackle storage. The Freedom 240 Fish sports 26-inch diameter pontoons for enhanced stability and better overall performance. The 240 DLX Fish also has an all-aluminum transom, a lifetime guaranteed Permadeck 2000 fiberglass reinforced synthetic deck, through-bolted floor construction, and a scratch-preventing twin rub rail system. 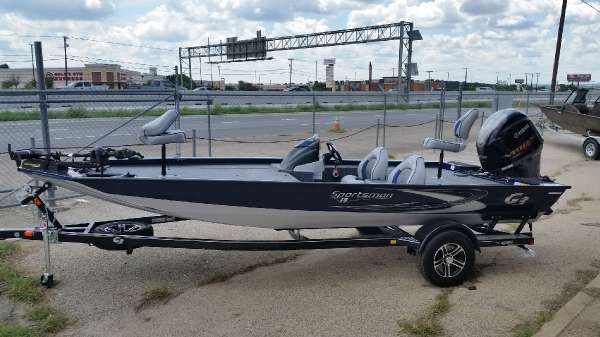 2017 G3 BOATS Sportsman 19 Expanded casting deck for full freedom of movement, recessed trolling motor for comfortable control, all-welded, all-aluminum. 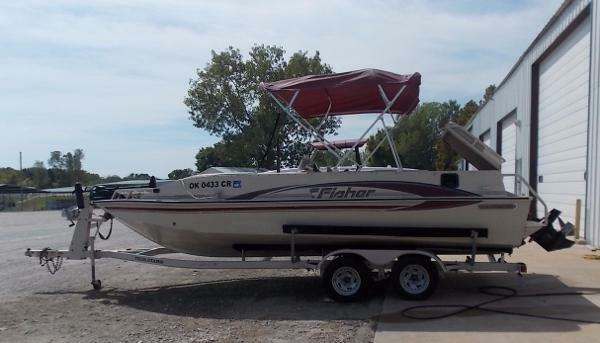 - Spacious and sporty fisher!